An informational site about the legislative attempt to remove control of Asheville/Buncombe's water system from the City of Asheville, and to take that precedent to other communities. Click here to see an updated summary of Rep. McGrady's statements and actions suggesting he is moving towards another attempt to seize or "regionalize" Asheville's water, and possibly Hendersonville's as well. Click here to see the video of the oral arguments in the case of City of Asheville v. State of North Carolina, before the NC Supreme Court, May 17th 2016. Click here to go straight to the moment where the attorney for the State of North Carolina incomprehensibly invoked the case of Flint Michigan, to support his argument IN FAVOR OF giving the State the ability to seize municipal water systems. Asheville Citizen-Times Guest Commentary, Mar. 11, 2018. Councilmember question: “It seems to me that what I’m hearing you say is that we’re past the time when anyone is looking to force a transfer, or a takeover, or otherwise seize or remove control of the City of Asheville over its water system?" He went on to link not getting satisfaction on Henderson County membership in MSD, as the sort of thing that might "force" him to go after Asheville's water again. study committee, he confirmed that he will likely be legislating (or "backing into") the representation issue. As he has pointed out repeatedly, 40 % of the customers of the City of Asheville's water system live outside city limits. In his hometown of Hendersonville, over 70% are not city residents. He has previously stated (Blue Ridge Public Radio, Dec. 20th) that this 'lack of representation' is of "primary interest" to him going forward. The fact that he now chairs a committee that is likely to be drafting legislation "requiring" the regionalization of certain municipal water/sewer systems... coincidence? Update Dec. 20th. In a surprising move, Buncombe County's Metropolitan Sewerage District voted 10 - 1 not to accept Henderson County's petition to formally join MSD. This would have given Henderson Co. 3 seats on MSD's Board - a move strongly supported by Rep. Chuck McGrady. Some Board members expressed concern about Rep. McGrady's new study committee, and that it might signal a move to go after Asheville's water again. Rep. McGrady called this theory "crazy", despite the fact that his new committee is charged with looking at exactly that, and he's been talking about taking another look at "regionalization" since the day that Asheville prevailed in the NC Supreme Court. "There's more than one way to skin a cat" is how he put it. He has also stated that the only thing stopping him from moving forward with his "nuclear option" as he calls it, is if "the parties appear to be working well together". His statement after the MSD vote? Full audio of the 12/20 Board discussion and public comments here. SaveOurWaterWNC members Barry Summers and Beth Jezek comments here. “There is more than one way to skin a cat." Henderson County Rep. Chuck McGrady said that on the day in 2016 that Asheville won the NC Supreme Court case over control of their water system. His actions since then strongly suggest that he is following through on his threat to try, try again to gain control over Asheville/Buncombe's infrastructure. "The big issue we’ve been dealing with is water and sewer in terms of the fight between Asheville and Hendersonville, which then turned into a fight between Hendersonville and Henderson County." Ask around, scour the local news from over the past year. You'll discover one thing: There is no fight between Asheville and Hendersonville. It appears that Rep. McGrady simply made this up out of thin air, to justify creating another study committee. And like its predecessor, led by McGrady and fmr. Rep. Tim Moffitt, it is about solving a problem that does not exist. According to the authorizing documents, one of the areas the committee will study is whether legislation requiring regionalization of public utilities is "necessary". Regionalization is another word for what was previously attempted - using State authority to force municipalities to give up control of their public assets. Rep. McGrady has referred to that as a "nuclear option" over the past year, and he's stated that he has considered using it against both Asheville and the City of Hendersonville. During the previous debate, it was believed by many that if/when McGrady and his allies succeeded in the forced transfer of Asheville's water system to a regional authority, Hendersonville's assets would be absorbed next. Fmr. Sen. Tom Apodaca of Henderson County suggested as much during the 2013 debate over that previous legislation, saying it would create a regional water/sewer authority that would serve Buncombe, Henderson, and even Transylvania County all the way to the south of Hendersonville. The biggest beneficiaries of such a "regionalization" would be Henderson County, which has no water or sewer treatment system of their own, and has long complained about both Asheville and Hendersonville's policies. There are two main differences between the study committee that's just been created, and the 2012 Moffitt/McGrady study committee. First, it is a joint House/Senate committee with far more members from both houses. And second, instead of a limited four meeting/four month operating window, McGrady's new committee has almost two years to hold meetings and draft legislation. If Chuck McGrady isn't planning something really ambitious, he wants people to think he is. Perhaps this is all part of an attempt by McGrady to pressure the City of Asheville into voluntarily ceding some concessions towards Henderson County. In any case, oh good lord, here we go again. Dec. 21st 2016: ASHEVILLE WINS!!! Read the full NC Supreme Court ruling here. No December 9th decision. The next possible date for a decision is Dec. 21st. No September decision. The next possible date for a decision on the Asheville water case by the NC Supreme Court is December 9th. No August decision. The next possible date for a decision on the Asheville water case by the NC Supreme Court is September 23rd. In a huge upset, a bill by Sen. Tom Apodaca, forcing district elections for Asheville City Council, is killed in the NC House. Objections came from some of the most conservative GOP House members. Full audio here. Possible date for a decision from the NC Supreme Court in the Asheville water lawsuit: June 10th. If no decision then, next likely date is in August. Check the Supreme Court opinion page here. May 17th, 2016 Shocker: In front of the NC Supreme Court, the attorney for the State actually invoked the state-of-Michigan-caused disaster in Flint, as part of his argument for the State takeover of Asheville's water system. Watch the WLOS video at timestamp 58:25. "When I think of service, I think of things like billing service, is my bill for water accurate, is it timely. I think about things like, is there adequate hydraulic pressure in the pipes - irrespective of whether the water is clean.The water in Flint, Michigan may not be the cleanest in the world, but it's a totally separate question to say that the hydraulic pressure was..." (cut off by Justice's interruption): "They're getting service and getting billed for it. Are you saying that doesn't relate to health and sanitation?" "No, I don't believe that it does, Your Honor." ...and then goes on to argue that the NC Supreme Court should "adopt a more relaxed view of the interpretation of the Constitutional phrase “relating to health and sanitation”.” He's referring to the part of the NC Constitution contained in Article II Section 24, which prevents the legislature from enacting local laws, meaning those that apply only to one town or city, having to do with the provision of water or sewer services. The State has given up the pretense that the Water Act is a General Law, meaning one that applies statewide (but coincidentally (wink) only really applies to Asheville). They've admitted that it is, in essence, a Local Law. So in order for the seizure of Asheville's water system to proceed, they need to persuade the Court to sweep aside the historical protections contained in Art. II Sec. 24. Despite the horrifying, contradictory example of Flint Michigan, they want the Court to embrace the assertion that forcibly transferring control of a municipal drinking water system from one government entity to another has nothing to do with health and sanitation. Along with allowing the State takeover of Asheville's water system, this radical change in interpreting the Constitution would allow future State seizures of municipal drinking water systems to occur in Local Bills, which are generally easier to pass and not subject to Governors veto. Is this the precedent that bill authors have wanted all along (as principal sponsor Rep. Tim Moffitt suggested in this 2014 interview), and water activists have warned about? Update: Watch the video of the NC Supreme Court hearing, via WLOS here. A decision is expected within a few months. Historic Burke County Courthouse This is the courtroom where the oral arguments in City of Asheville v. State of North Carolina et al, will be heard. 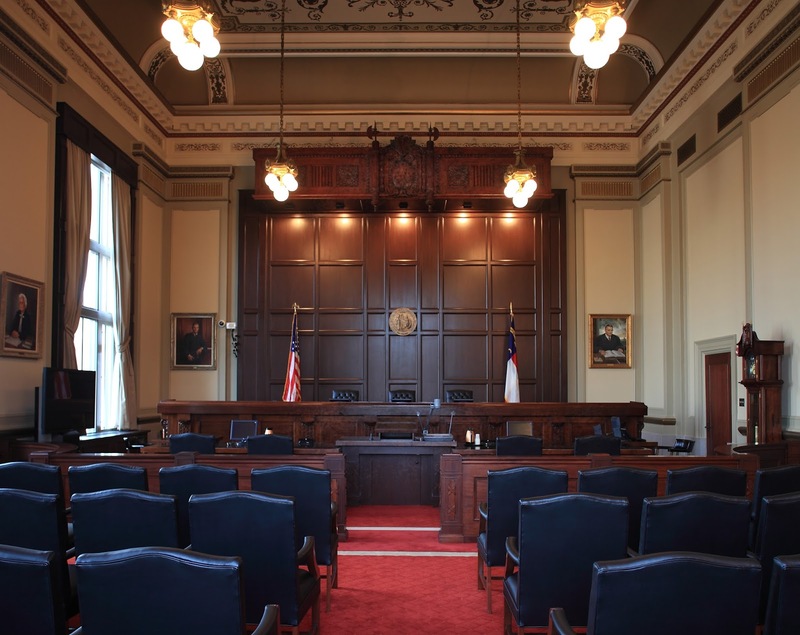 The case deciding the fate of Asheville's water system will be the first NC Supreme Court hearing held in this courtroom since the early days of the American Civil War. Read the documents, including Amicus Briefs filed in support of Asheville's case, here. Documents from the Court of Appeals case can be read here. Superior Court Judge Howard Manning's original ruling in favor of Asheville can be read here. Feb. 29th. The North Carolina Supreme Court will hear oral arguments in the case of City of Asheville v. State of North Carolina et al, on May 17th 2016. The hearing will not be held in the Supreme Court in Raleigh, it will be heard in the 'Historic Burke County Courthouse', in Morganton NC. See the calendar here. March 28, 2013 Crazy Coincidence Department: On this day, the State of Michigan's new law enabling 'emergency managers' to take over all aspects of municipal governments in the face of financial difficulties, took effect. The actions of Flint's 'emergency manager' appear to have led directly to the poisoning of thousands of city residents, as lead from aging pipes leached into their drinking water. Also on this day, Rep. Tim Moffitt filed the bill to allow the State of North Carolina to seize control of the City of Asheville's water system. The crux of the State of North Carolina's case justifying the takeover of Asheville's water is this: transferring control from one govt. entity to another does not "relate" to health and sanitation. If it did, the prohibition against certain "local" bills, contained in the NC Constitution, would prevent the transfer. So, does the unfolding disaster in Flint make it increasingly difficult to pretend that who controls water has no bearing on "health and sanitation". Good luck with that. Jan. 29, 2016 The NC Supreme Court has announced they will take up Asheville's appeal, in the lawsuit attempting to stop the State seizure of their water system. Read the order here. More info as we get it. At the same time as the Asheville announcement, the Court released it's decision on McCrory v. Berger. That case involves the dispute between Governor McCrory and the General Assembly, over their attempt to unilaterally take over appointments to important State Commissions. The Court ruled in McCrory's favor, stating that "the legislative branch has exerted too much control". Could this, and the fact that the Court chose to hear Asheville's case at all, indicate which way they may eventually rule? Nov. 24th The City of Asheville files their Notice of Appeal and Petition for Review to the NC Supreme Court. The State has until Dec. 7th to respond. Read the petition here. Read the request for a stay of enforcement of the Court of Appeals decision here. In October of 2014, the Town of Boone, NC filed a lawsuit to block a recently-passed law that took away the town's right to regulate their ETJ (extra-territorial jurisdiction). The Boone lawsuit was the first to be filed under a new law passed by the General Assembly requiring the case be heard by a 3-judge panel instead of a single Superior Court Judge, as the Asheville lawsuit was. In July 2015, Boone won their case. The 3-judge panel declared the law “unconstitutional pursuant to the prohibition on local acts contained in Article II, Section 24 of the North Carolina Constitution"
This ruling by the 3-judge panel was similar in one key point to the City of Asheville's trial court victory in June of 2014 against the taking of their water system (from a single Superior Court Judge): "The Water Act, a local act, was enacted in violation of the provisions of Article II, Section 24(1)(a) and Section 24(1)(3)"). The State appealed both the Boone and Asheville decisions. Instead of going to the Court of Appeals (as Asheville's case did), the new process sent the Boone case straight to the NC Supreme Court. The oral arguments in front of the Supreme Court took place on Oct. 6th 2015 (video of those arguments here), the same day that the Court of Appeals issued the decision striking down Asheville's trial court victory. Despite the fact that the Town of Boone filed their lawsuit months after the Asheville lawsuit, they essentially leapfrogged over Asheville to the NC Supreme Court. On Nov. 5th, the Supreme Court denied the State's attempts to throw out Boone's 3-judge panel victory, and indicated that they still intend to rule on the central point: the same issue at the heart of Asheville's case - the Article II Section 24 prohibition against local laws on certain topics that target only certain municipalities. No word on how or when the Boone case will come back up at the NC Supreme Court, or when (or whether) the City of Asheville's case will be heard. Also unknown, are the implications of the fact that these two cases hinge on the same legal principle, and that they are both landing on the Supreme Courts doorstep at the same time. And one of the disputes related to the State's attempt to restrict Boone's ETJ authority? Yes, you guessed it: Control of water. Nov. 9th Asheville petitions the NC Court of Appeals to re-hear the case, asserting specific flaws in the Courts decision. The next day, the Court denies the petition without explanation. Asheville then petitions the NC Supreme Court to hear an appeal. Oct. 13th Asheville City Council votes unanimously to appeal the decision to the NC Supreme Court. "When the law passed in 2013, legislators said the merger should save the average ratepayer $120 per year"
The Asheville water system serves roughly 54,000 ratepayers. 54,000 times $120 equals $6,480,000. This claim is completely contradicted by the facts. In 2012, the Metropolitan Sewerage District commissioned the private firm Arcadis to perform a study on the economics of a transfer. Under parameters determined by MSD, the study projected a modest $1.142 million average annual "savings" from the transfer. But that figure derives entirely (and then some) from the elimination of what's known as "the Sullivan Act Transfers" - the 5% of water revenues that the City of Asheville was authorized by law to spend on street and sidewalk repair related to water system maintenance. However, the legislature removed that authority in 2013, in a bill co-sponsored by the same legislators that sponsored the Asheville Water Act. This was an act completely independent of a transfer of the water system. In fact, the City has continued to operate the system without the Sullivan Act Transfer authority in the 2 1/2 years since the bill was passed. An honest accounting of the projected cost/savings of a transfer of the water system from the City to MSD cannot include the 'Sullivan Act Transfers' line item. Once it is removed, MSD's own optimistically-framed study shows that not only will there be no savings, it will actually be less efficient than leaving control of the system with the City of Asheville. When this was pointed out to MSD Board members in June of 2013, Board Chairman Steve Aceto said, "What's good for the goose is good for the gander. ", implying that the City of Asheville hadn't always been honest in their numbers relating to the water system, therefor MSD was under no obligation to do so. If MSD's own study showed there would be little or no "savings" resulting from a transfer, why did "legislators" (presumably Reps. McGrady, Moffitt and Ramsey), suggest that some $6.5 million in annual savings will be coming to water customers? And why is it still being touted as true in the local media? Oct. 6, 2015: The NC Court of Appeals has ruled in favor of the State of North Carolina in the case of the control of Asheville's water system. The City is expected to file for an immediate stay of implementation and appeal to the NC Supreme Court. Watch the 65 min. video of the NC Court of Appeals hearing here. June 3rd Three Judge panel of the NC Court of Appeals hears the oral arguments on Asheville v. North Carolina (read all documents here). A decision is expected sometime within two months. May 12th The NC Court of Appeals calendar is out, and oral arguments in the case of "The City of Asheville vs. the State of North Carolina et al" will happen at 9:30 am on Wednesday June 3rd, at the NC Court of Appeals Building in Raleigh. May 11th The State of North Carolina's final filing in the water lawsuit appeal was filed - it contains some harsh language (read it here). The State is criticizing Asheville's "continued reliance upon incompetent, irrelevant and inadmissible evidence allegedly attesting to the intentions of individual members of the General Assembly concerning the Act as of the time the General Assembly enacted it." Ooooo, snap. May 7th The NC League of Municipalities has filed an Amicus Brief supporting the City of Asheville. Read it here, and read all the other documents filed in the Court of Appeals here. April 27th The City of Asheville's Appellee's Brief in the Appeals Court round of their lawsuit has just been posted online. Read it here. And a surprise filing - an 'Amicus Brief' from the City of Wilson NC, supporting the City of Asheville. Apparently, it's sinking in elsewhere that if they can do it to Asheville, they'll do it to you. That's essentially the reason given by the City of Wilson in the summary of their position. Read it here. The full Amicus Brief can be read here. The State has two weeks to respond, after which the Court will decide whether to hear oral arguments, which is expected. March 6th Attorneys for the City of Asheville have requested a 30 day extension to the deadline for the submission of their brief, and an expansion of the word limit. Lots to say, apparently. Feb. 27 The State of North Carolina has submitted their Appellant's Brief. Read it here. Some sad news - Gary R. Govert, the Assistant Solicitor General preparing to argue the State's case before the Court of Appeals, has passed away. Special Deputy Attorney General I. Faison Hicks, who argued the case before the Superior Court, has taken it back over for the State. Jan. 14 Lawsuit update Due to the State requesting a two-month delay in submitting their "Appellant's Brief" in the case, it's unlikely that a panel to hear their appeal of Judge Manning's Summary Judgement in favor of the City of Asheville will be selected until April. It's likely that a ruling won't happen until late summer or fall. After some negotiating, the official trial record has been agreed to. Read it here. Check back here for updates, or the NC Appellate Court site for other documents. Tryon NC update 2- 3 years ago, around the time that the attempt to seize Asheville's water system began, it was reported that a somewhat mysterious company based in Texas was trying to purchase the water system operated by Tryon NC (pop. 1683). Tryon, 45 miles south of Asheville, sits at the intersection of a network of pipelines that connect many of the major sources of fresh water that serve WNC communities. When Tryon balked at the idea of selling their water system, and started asking Ni America pointed questions, the offer was withdrawn. It was never clear why anyone would want to purchase this small town water system, plagued by high maintenance costs and limited revenues. Could this be why? He did not go into specifics, but given that the Water Act had been struck down in Superior Court principally because it only applies to Asheville, it's not clear what could "correct" that, other than making the State seizure of municipal water systems apply to some other NC city or town, as well as Asheville. Nov. 4th, 2014 NC House Rep. Tim Moffitt is defeated by Democratic challenger Brian Turner, and Rep. Nathan Ramsey is defeated by John Ager. The only sponsor of H488 to keep his seat is Henderson County Rep. Chuck McGrady. Aug. 29th The transcript of the final May 23rd hearing in the lawsuit before Judge Howard Manning has been released. Read it here. Sometimes humorous, very informative. A good read, if you want to understand the legal issues involved. And Judge Manning's June 9th ruling in favor of the City of Asheville is here. 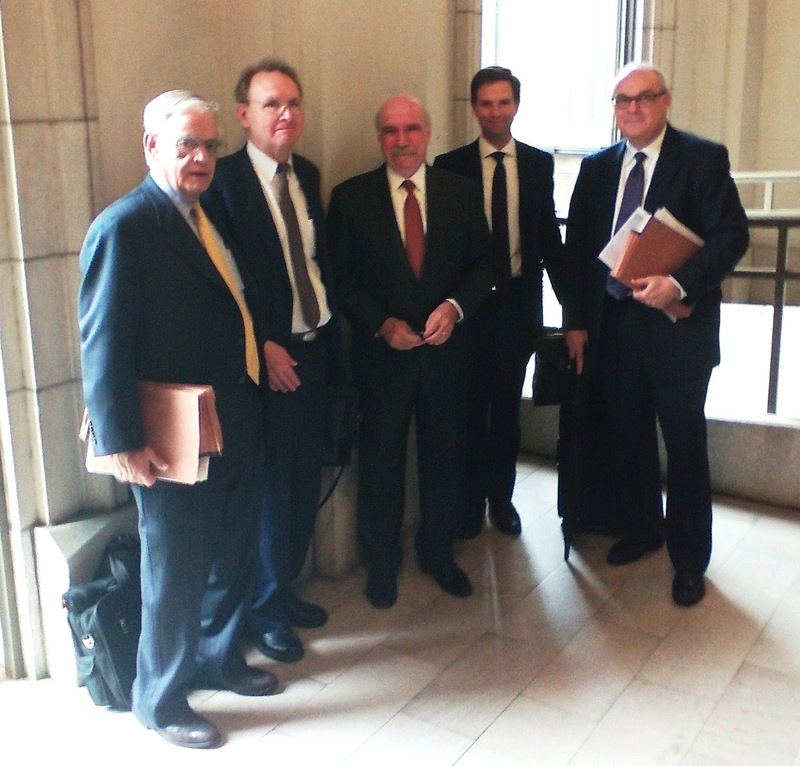 July 8th The State has filed their "Notice of Appeal" in the Asheville water lawsuit ruling. Read it here. Barring any extraordinary developments (see the "stay the relief" entries below), the conventional timeline for an appeal of this sort is 12 - 18 months. Check back for updates. July 2nd Update The "stay the relief" provision cited below, has appeared in another bill, HB189. It still has the potential to be enacted before the end of the NCGA short session. July 1st The NC Attorney General's office has yet to file an appeal in the Asheville water lawsuit. They have until July 9th. ...which could become significant, if this provision were to become law beforehand. Introduced anonymously to Senate Bill 744 (page 218) in the NC House Finance Committee, it could have the effect of "staying" the relief granted to the City of Asheville, ie: the prevention of the State seizure of its water system. "Staying" this relief would allow the State to implement the seizure and transfer of the water system to MSD despite having lost in the original trial court. The City of Asheville would then have to win on all appeals in order to (years after the consolidation was a fait accompli) attempt to claw the system back into municipal control. The provision disappeared from later versions of the bill, perhaps because it is an absurd overreach of the Legislative Branch over the Judiciary. Even if it re-appeared, passed the NCGA and was signed into law by the Governor, it's unclear if any NC court would actually enforce it. But somebody floated it anyway. Why? This will come as something of a shock to his fellow legislators, who took care to ensure that they weren't setting a precedent that could come back to seize their water systems. June 12th The State of North Carolina will appeal the ruling blocking the seizure of Asheville's water system, a DoJ spokesperson confirmed. There had been, and still is, the possibility that the NC General Assembly might choose to use new authority they granted themselves last year, to intervene in the case. Currently, however, the appeal will be led by NC's Attorney General, Roy Cooper. No dates have yet been announced. June 10th The day he lost the lawsuit, Rep. Moffitt stated that he is "somewhat amused" that NC Cities can sue the State Government at all. June 10th Rep. Moffitt has announced that he will abolish the newly-created Buncombe County Culture and Recreation Authority. 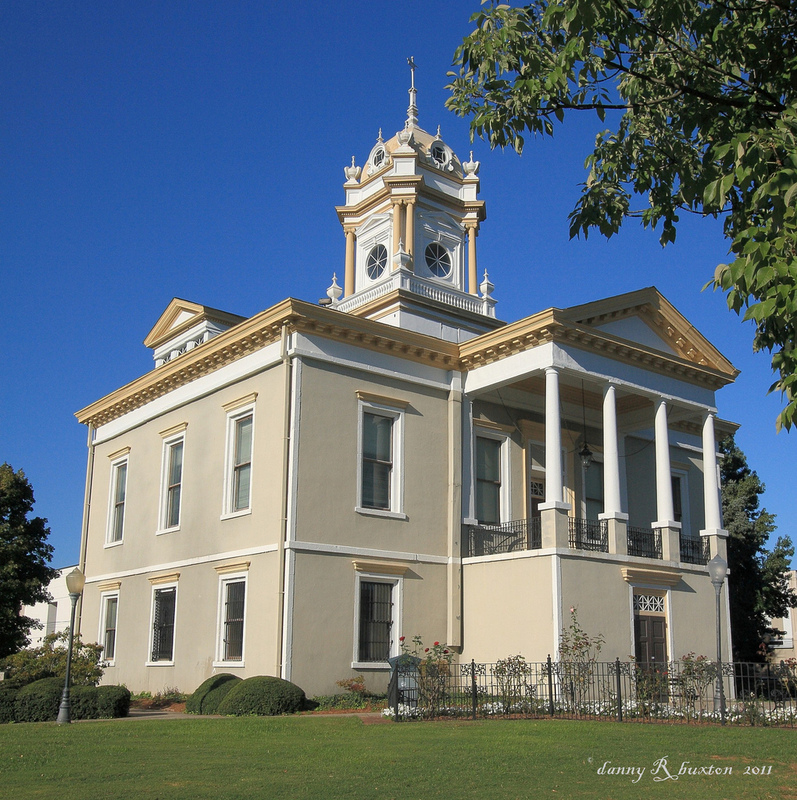 It was originally envisioned to benefit both City and County, but the City was excluded from it by Rep. Moffitt, after they filed the lawsuit over the taking of their water system. He was later caught on tape admitting that he had done it specifically in retribution of that act. Now, the day after losing that lawsuit, he and Rep. Nathan Ramsey have decided to permanently prevent the City and County from collaborating on shared recreation facilities and cultural activities. 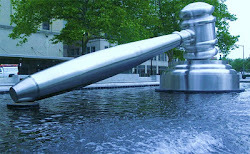 "Culture and Recreation Authority Created"
June 9th The City of Asheville has won the lawsuit against the forced taking of its water system. Read Judge Manning's ruling here. The next decision rests with NC Attorney General Roy Cooper. Will he appeal the ruling? Reps. Moffitt, McGrady, and Ramsey have made statements suggesting they expect him to. Rep. McGrady has gone further, suggesting that if Cooper decides not to appeal, the NCGA may intervene and fight the appeal without him. It's unclear if they actually have the authority to do so, or if the will exists in the General Assembly to further expend resources and political capital defending what is an unpopular new concept: The State owns all your public infrastructure, and can seize it and give it to whoever they want. Cooper has thirty days to decide whether or not to appeal. May 23rd: Final arguments were presented in the City of Asheville's lawsuit against the forced transfer of their water system. A ruling is expected anytime before June 23rd. Some random thoughts here, fuller description coming. The date for the final hearing on the Asheville water lawsuit: May 23rd. We expect a ruling within 30 days after that. Whichever side loses is almost certain to appeal. A bit of historical context on the the roots of the Asheville/Buncombe water disputes: Boom and bust real estate cycles going back to the 1920s. Filed on Feb. 27th: The State of North Carolina's Motion for Summary Judgement in the lawsuit over control of Asheville's water system, makes a very peculiar assertion: that the 'Water Act' applies to Greenville NC, as well. The cornerstone of the City's case is that the law is unconstitutional, since it targets only one city's water system - Asheville. Enter the shenanigans we dubbed "The Greenville Gambit". Towards the end of the 2013 session of the NCGA, an amendment to the water seizure law started springing up in unrelated bills, presumably introduced by Rep. Tim Moffitt or his allies. Intended to remove one of the three criteria in the law that make it apply only to Ashevillle, it would have had the effect of making it apply to one other NC municipality: Greenville. The obvious intent of this was to undermine one aspect of Asheville's lawsuit. The City of Greenville and their reps in the House and Senate were not pleased, and their opposition blocked the amendments. At the last minute, though, they appeared to agree to a compromise. Senate Bill 341, the "Amend Interbasin Transfer Act" had had the original amendment inserted anonymously in the House Environment Committee. But then Rep. Brian Brown of Greenville introduced a second amendment, when the bill reached the full House. The effect of the first was that it made the Asheville seizure law apply to Greenville, but then under the new set of criteria introduced by Rep. Brown, made it not apply to Greenville after all. We all scratched our heads, but given that the two amendments together appeared to leave Greenville off the chopping block, it passed easily and became law. The State Motion made on Feb. 27th acts as if that second amendment does not exist, and that Greenville will soon be forced to surrender their water system to a forced regionalization, same as Asheville! "If Greenville's and Pitt County's populations continue to grow at this rate, it is reasonably foreseeable that Section 1(a) of the Act will apply to the Greenville water system in the near future." No one who has read this Motion can yet make sense of how the State intends to convince Judge Manning that the second Greenville amendment does not mean what everyone else believes it means. And no public reaction as of yet from Greenville or her representatives in the NCGA, but they cannot be pleased. March 17th Save the date! "What Next For Asheville's Water?" Mountain Voices Alliance, SaveOurWaterWNC, Clean Water for North Carolina, Asheville PARC and the WNC Alliance will co-sponsor an educational forum on the Asheville water issue, including an update on the status of the lawsuit and other issues affecting the future of water in our region. Speakers will include Asheville Mayor Esther Manheimer, Clean Water for NC Asst. Director Katie Hicks, and Barry Summers of SaveOurWaterWNC. March 17th, 6 - 7:30 pm. at Lord Auditorium, Pack Library, downtown Asheville. Download the press release here. Dec. 19th The Nation magazine has recognized the "Mountain Moral Monday" event in August as the "Most Valuable Protest" in America during 2103. Thanks go to SaveOurWaterWNC members Elaine, Heather, Valerie, Beth, the NAACP, and all the local and regional groups that cooperated to put on this nationally-recognized event of civic activism. The Public Enterprise System & Use of Funds Study Committee is charged with looking at the allowable uses of government-owned corporation funds and then making recommendations to the General Assembly to ensure transparency, proper funding and the improved management of public enterprises run by local governments. Public enterprises are business organizations owned by the state (such as airports, transportation systems and sewer or water systems) that are controlled by a public authority. "Essentially, we have a system today where the fox is guarding the henhouse,” commented Rep. Moffitt. “Given the potential for the abuse and misuse of such a system, it’s only prudent that we study this issue and ensure best practices are in place to protect both the ratepayers and the taxpayers." Two issues of concern: The argument underlying the intent of this committee is pretty clear – all through the debate about the Asheville water system, we heard that the City is “stealing” revenue from the ratepayers every year, to support it’s general fund. The fact that the amount diverted from the ratepayer revenues goes to cover the City’s cost of managing the water system never seemed to penetrate the talking point, even when GOP Rep. Chuck McGrady tried to stop the spreading of that (in his words) "very bad information". Continuing that argument on a statewide level suggests that there may emerge legislation intended to prevent municipalities from recovering the full costs of operating enterprise fund activities like water, sewer, transportation systems, etc., placing further economic strain on local governments, and theoretically making the option of privatizing public infrastructure more attractive. The second, somewhat more worrying issue: "Public enterprises are business organizations owned by the state". Are Rep. Moffitt and others in the GOP leadership preparing to assert that municipalities do not even own the public infrastructure they built and operate? This radical concept was introduced during the Asheville water debate. The argument goes, that since the system was funded almost exclusively through ratepayer revenue, the City could not claim to "own" it - it belongs to the "ratepayers". This concept has never been tested in court, but Rep. Moffitt appears to be asserting it as if it had, and that it applies statewide to any infrastructure operated by local governments as a "public enterprise." Nov. 13th: NC Department of Environment and Natural Resources Deputy Director Mitch Gillespie tells the Environmental Review Commission, a joint NC House and Senate body, that there is a "possible basin" for natural gas shale deposits in Western North Carolina and that DENR is "going to go out there" and start exploring. This could represent major news on the fracking front - previously, all potential NC gas shale deposits were believed to be in the central/eastern part of the state. Water usage is a major component of the controversial nature of hydraulic fracturing, and the possibility of fracking coming to WNC puts the fight over Asheville's water system in a new light. Oct. 9th: As expected, the Judge in the Asheville water lawsuit has persuaded the parties to dispense with the preliminaries and go straight to Summary Judgement. The rulings on motions from the State and the City will be dismissed, and instead we will have a final hearing (on the Superior Court level at least), sometime in Feb. or March. Read Judge Howard Manning’s “Stipulated Case Management Order” here. Sept. 14th: Using language similar to the justification of the seizure of Asheville's water system, Watauga County officials and State Rep. Jonathan Jordan confirm they are considering the creation of a regional water system, which would require the Town of Boone to surrender control of their water to the County. "There will be opposition," Blust said. "But water is going to be like gold - whoever has the water has the control and the power, and I just don't want that to get in the wrong hands. I'd rather that be in the elected body of the county rather than just one town." Aug. 11 Mountain XPress reports on Rep. Moffitt's comments that leaving Asheville out of the County-wide Culture and Recreation Authority was explicitly in retaliation for fighting back on the water issue. Barry's remarks on the water issue at the Mountain Moral Monday event. 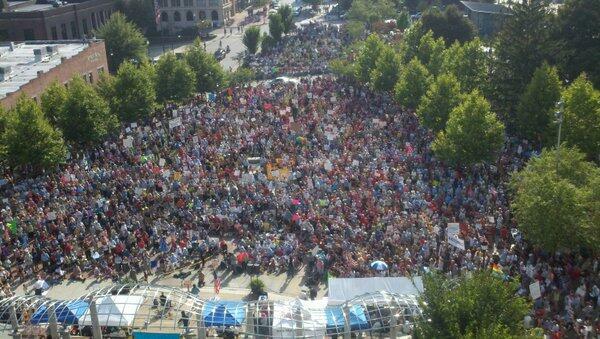 Mountain Moral Monday was a huge success. Estimates range between 5000 and 10,000 people - the largest political event in WNC in recent memory. See the trailer for the upcoming documentary here. August 5th Rep. Tim Moffitt tells the Asheville Board of Realtors that he & the other legislators who crafted the Buncombe County Culture & Recreation Authority bill, kept the City of Asheville from joining the CRA explicitly because they filed a lawsuit over the seizure of their water system. This confirms earlier reports that this threat was levied against the City, but was denied at the time by these same legislators. Update!! For the second time, attorneys for the State of North Carolina have asked for & received a delay in the start of the lawsuit over Asheville's water. The new date is September 6th, 2013. The Temporary Restraining Order still prevents the seizure of the water system and watershed owned by the City of Asheville. August 5th Mountain Moral Monday. Co-sponsored by SaveOurWaterWNC, western North Carolina joins the protests against radical legislation coming out of Raleigh, including the takeover of our water. NC NAACP President Rev. Dr. William J. Barber II will speak, along with a myriad of local and regional voices (including Barry of SaveOurWaterWNC). Aug. 5th, Pack Square in downtown Asheville, 5 - 6:30. Details here. "SECTION 1. (g) For purposes of this section, a public water system shall not include any system that is operated simultaneously with a sewer system by the same public body, in conjunction with the provision of other utility services for its customers." Since Greenville does in fact operate a sewer system alongside it's water system, they are now excluded from the potential seizure of the water system. So, the provision that repealed a portion of the Asheville water seizure law, in an attempt to undermine the City's pending lawsuit, is still in the bill. But the new provision still excludes Greenville from future forced consolidation, so it's unclear why the amendment was put forward at all. The Asheville seizure law is unconstitutional, because it applies only to one city's water system. Making Greenville also appear to be vulnerable to forced consolidation, was the intent of the original S341 amendment. Simply changing the method whereby Greenville is excluded, makes no sense. July 9th Senate Bill 341, the "Amend Interbasin Transfer Law" bill, has the same amendment that drags Greenville into the Asheville water dispute. It was voted through the House Environment Committee on June 20th, but has not yet been "reported out" to the full House. It can re-appear as a viable bill at any time. A scanned version of the bill, and the summary, can be seen here. Additionally, Senate Bill 112, the companion bill to H94, has appeared on the agenda for Rep. Tim Moffitt's House Govt. Reform Committee. It will come up 10 am Wednesday the 10th. Expect provisions ranging from fracking to the 'Greenville Amendment' to appear there as well. Listen to the hearing at 10 am Wed. the 10th here. "The overreach exhibited in this case cannot be allowed to stand, and this city should be a vocal proponent of Asheville as it continues this fight." "Rep. Tim Moffitt, a Buncombe County Republican who is the primary proponent of the Asheville water system transfer, would not say why or by whom the language affecting Greenville was inserted into the environmental amendments bill. "Rep. Chuck McGrady, a Henderson County Republican who backs the transfer, is a co-sponsor of the environmental amendments bill. He could not be reached for comment Monday or Tuesday." "Manheimer and Barry Summers, an Asheville activist opposing the transfer, both said the attempt to change the water transfer law highlights a problem with the other side’s case. “It’s very clear the only reason that this has been inserted into this bill is that they know that the seizure of Asheville’s water system is unconstitutional,” Summers said." July 2nd With the entire leadership of the town of Greenville looking down from the gallery, the Senate voted unanimously to remove the line in House Bill 94 that would have dragged them into the Asheville water dispute. How will Reps. Moffitt, Ramsey, and McGrady make the seizure of Asheville's water appear to be constitutional now? Stay tuned. June 28th Greenville NC discovers that due to a provision in H94, they too could be subject to a forced surrender of their water system. (original article - subscription required) (full text) (editorial: Hands Off Water System). "SECTION 34. Section 1(a)(2) of S.L. 2013-50 is repealed." S.L. 2013-50 is the 'Seize Asheville's Water' legislation, which is under legal challenge by the City of Asheville. The section that H94 intends to repeal is one of the key criteria that restrict the forced consolidation to only apply to Asheville. Repealing this section after it was put in place to gain the votes necessary for passage, is solely intended to weaken the City's lawsuit. Save the Date!! June 24th Save Our Water WNC goes to Raleigh, to join the NC NAACP Moral Monday protest in front of the NC General Assembly!! Tell our legislators Hands Off Our Water!! $20 roundtrip to Raleigh is being arranged - Download the flyer with all details here. June 6th: E-mails released by the City of Asheville show that NC Reps. Moffitt, McGrady, and Ramsey (sponsors of H488, the bill seizing Asheville's water), have been secretly pressuring the City to, in the words of the Vice-Mayor, "settle the lawsuit or else". Threats reportedly include legislation delaying scheduled 2013 City Council and Mayoral elections for a full year. June 4th: The General Assembly passes H252, the "Asheville Tranfers" bill. This legislation repeals the City of Asheville's ability to use water revenues to repair streets and sidewalks related to water system maintenance. This takes that amount off the ledger of costs/savings resulting from a merger of the water system with MSD. The last veil is pulled aside: the merger will lead to higher costs and eventually higher rates for water. May 20th: City of Asheville petitions NC Superior Court Judge Howard Manning Jr. for a preliminary injunction to halt implementation of H488 during trial of civil lawsuit. Read the City's suit against the State of North Carolina and the Metropolitan Sewerage District here. May 14th: H488, the "Regionalization of Public Utilities" becomes law without the Governor's signature. The City of Asheville has filed suit, and has been granted a Temporary Restraining Order to block implementation of the forced transfer of their water system. May 7th: Asheville City Council passes resolution authorizing legal action if water/sewerage merger bill should become law. April 24th 1 pm. Listen to the NC Senate Finance Committee discussion of H488, "The Regionalization of Public Utilities" here. April 9th, 8:30 am NC House Finance Committee considers H488, the "Regionalization of Public Utitlities Act". "Rep. Moffitt... The MSD report clearly suggests that a merger will actually cost somewhere in the neighborhood of $600,000 annually, and that's on top of the $2 million hit to the City of Asheville. Given that, can you still claim that a merger will actually save money?" "Thank you Barry. The answer to that is yes. But I would tell you that neither you nor I have the gift of predicting the future. So studies are exactly what they are, numbers are exactly what they are, but consolidating these three public enterprises is the right thing to do for our region..."
The bill sponsors now have absolutely nothing to base their claims of "savings" to ratepayers on, and in fact, all of the studies now show that there will be no savings, only red ink, from a forced merger. And that's before any talk of compensation to the City for their 100s of millions of dollars worth of seized assets. Mar. 28th In a bill that does not mention "Asheville" even once, NC Reps. Moffitt, McGrady, and Ramsey initiate the unprecedented State theft of a municipal water system, and the City-owned watershed that feeds it. After seizing the assets belonging to the City of Asheville, the "Regionalization of Public Utilities" bill sets up a new category of State-chartered agency that could be established in any County in North Carolina: one that municipalities could then be forced to turn over their water or sewer assets to without compensation. Asheville is clearly the test case in a "watershed moment" for North Carolina, one that will determine: do the people control their local water and infrastructure, or does it belong to The State? Ladies and gentlemen, start your lawyers! City of Asheville releases analysis of the impact of losing the Sullivan Act Transfers. Asheville has not diverted revenue from the water system to subsidize its general fund. Mar. 26: After criticism by local activists & at least one Council member, XPress issues revised story that acknowledges $4 million annual cost to City taxpayers from forced merger. Still no mention at all of likely compensation or watershed lease costs (previously reported by XPress), which would send merger costs significantly into the red for ratepayers. Mar. 21: Asheville's Mountain XPress reports on the final report of the MSD impact study, repeats the fallacy that a forced merger will produce "potential net savings to water customers of $1.1 to $2.2 million per year over the next nine years." The only way such "savings" will occur for water customers is if the City of Asheville voluntarily relinquishes the water system and 22,000 acre watershed for not one thin dime of compensation, and if the City's budget can absorb an annual loss of $4 million revenue without serious tax increases for the 62% of water customers who are also City residents. Mar. 6th: Reps. Moffitt, McGrady, and Ramsey introduce legislation repealing the 'Sullivan Act Transfers'. The Sullivan Transfers allow the City of Asheville to use up to 5% of water revenues for street and sidewalk repairs related to water system maintenance. Losing the transfers will cost Asheville taxpayers approx. $1.5 million annually. Is this merely one more whack at the City, or is this a sign that Reps. Moffitt & McGrady have abandoned their intention to seize Asheville's water system? Feb 26th. Rep. Tim Moffitt co-sponsors legislation to create an "Infrastructure Oversight Commission". If your goal was to set the State of North Carolina on a path to privatize public infrastructure, this is how you would do it. Background, ALEC connections, suppositions, etc. here. Feb 22nd: Greensboro News&Record Op-Ed by Barry Summers: The time is now for North Carolina towns and cities to adopt the League of Municipalities resolution opposing such seizures, and for citizens to contact their legislators to oppose this radical reshaping of our shared resources. The House bill stripping the Charlotte airport from the City of Charlotte is co-sponsored by... a majority of the Asheville water Study Committee members including Rep. Tim Moffitt. Feb. 2nd: SaveOurWaterWNC goes to NC Dem. Executive Committee meeting, Durham. "Moffitt, also contacted after the meeting, said that municipalities shouldn’t be concerned about owning water systems. That is because as public utilities, systems should be thought of as independent services for ratepayers. And any debt from building a system would be carried by ratepayers, not city taxpayers, the South Buncombe legislator said." Breaking: City of Asheville announces temporary water discoloration due to scheduled inspection of water mains. Read the documents describing the process, scheduling, and purpose of this inspection here. Read the August 14, 2012 City Council minutes authorizing this work, here. Jan. 24th: North Carolina League of Municipalities chooses their #1 Advocacy Goal for 2013: "Oppose legislation that weakens or removes local control over public utility systems, specifically including municipal water and/or sewer systems." Raleigh/Durham's Indyweek includes Asheville situation in rundown of emerging State Govt. trend: "The Environment Could Take a Beating", by Lisa Sorg. MSD breakdown shows that City of Asheville comprises 60% of MSD customers, pays 80% of the bills, yet if Rep. McGrady follows through on plans to give Henderson County 3 seats on MSD Board, Asheville representation will drop to 20%. Rumor Control: Rep. Chuck McGrady urges people to stop spreading "very bad information" ie, that the "City of Asheville is robbing their water system, even now, after Sullivan." After acknowledging that the City has presented verifiable water revenue accounting that disproves this, he says that "we need to get some group of people to stop talking about that." Is he talking about you? Barry interviewed by Ned Ryan Doyle for Our Southern Community. Download entire show here. "Asheville is fighting to keep its municipal water system and avoid a soaking. But the state legislature has the last word. Other cities should tune in to this drama playing out in the water-wealthy mountain community." NC League of Municipalities: Sample resolution opposing the forced transfer of municipal-owned water systems. Thanks are due to Local Edge host Blake Butler for years of service to the Asheville community - we wish him luck in all his future endeavors. City of Asheville staff release memo that suggests: "if Cane Creek merger happens, City/MSD will end up subsidizing Henderson development." be paid by Buncombe ratepayers. reporting on City's financial analysis. Last month on Election Day, 86% of Asheville voters said 'No' to the idea of selling or leasing the Asheville water system. In fact, as AC-T op-ed writer John Miall commented after the election, "I can't remember a time when 86% of Asheville voters agreed on anything. Talk about a mandate." In spite of these results, the NC legislature is sharpening knives in anticipation of carving up the water system come January. If allowed to happen, this would be an unprecedented state government action that should send fear statewide into every community. On Saturday, December 8, the leaders of the North Carolina GOP, including Governor-elect Pat McCrory, will be gathering at the Grove Park Inn for the annual Charles Taylor Republican fundraiser. Join us beginning at 4:30 pm as we gather in protest on the corner of Charlotte St. and Macon Ave. to raise the visibility of the water issue before the very legislators who will be voting on this matter. This is your chance to be seen and heard – as well as provide a citizen face in opposition to the taking of Asheville's water system by legislative fiat. We will create a line of voters stretching up Macon Ave. with signs and messages relating to the water issue. We expect to conclude once the Republican fundraiser begins between 7-7:30 pm. PLEASE reach out to your personal networks and invite them to join the rally by forwarding this message to your e-mail list, Facebook friends, and neighbors. Families with children are welcome and encouraged. Numbers count! SUGGESTIONS: chairs are welcome; bring flashlights and signs; wear reflective or light-colored clothing; water if needed. Previous posts moved to History page. Referendum result: 34,695 (85.54%) No, 5,864 (14.46%) Yes. Protect Asheville Public Water, Fight Privatization!